I always thought it would be cool to have a clock that would tell you when it was time to do things. 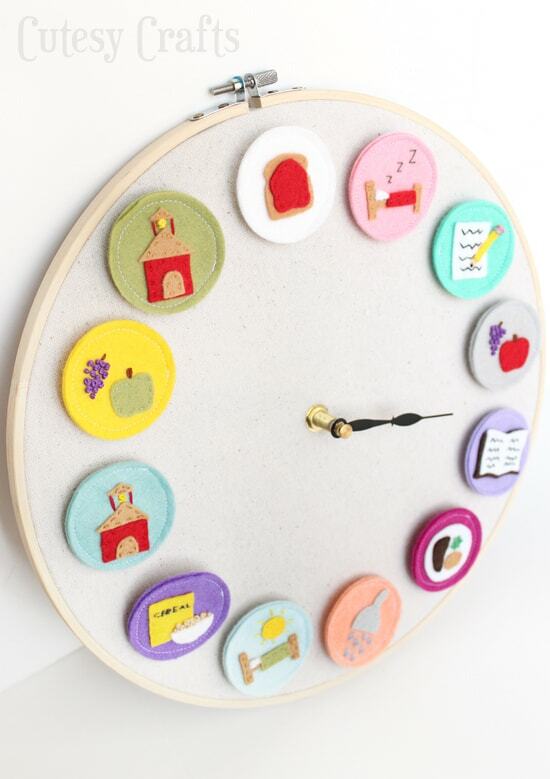 The kids are constantly asking me things like “When is it snack time?” or “Why do I have to do my homework now?” With this working DIY clock for kids that I created, they can see for themselves when it’s time to do some of their daily activities. And because our schedule changes sometimes, all of the pieces are attached with velcro to be interchangeable. This is going to be perfect for getting us back on a schedule when school starts. Notice I’ve got two different school drop offs now. Let the craziness begin! I also made some blank circles for when there is nothing planned. You can make whatever you want. A soccer ball, ballet shoes, a tree at the park, etc. 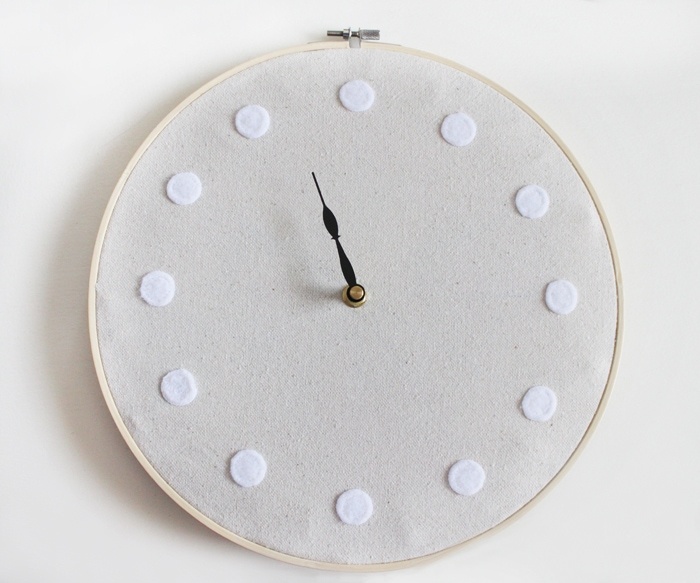 I used a piece of a canvas drop cloth to make the clock. 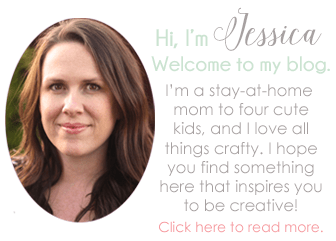 You can just buy a piece of canvas fabric or duck cloth. 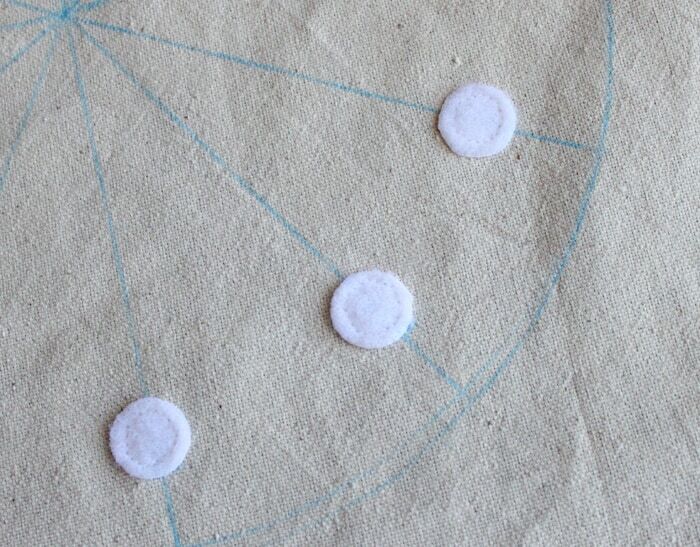 Trace the innermost part of your embroidery hoop with your disappearing ink pen or washable pencil. Measure out equal parts like I did below. I used the 60° angles on my ruler to make the marks. 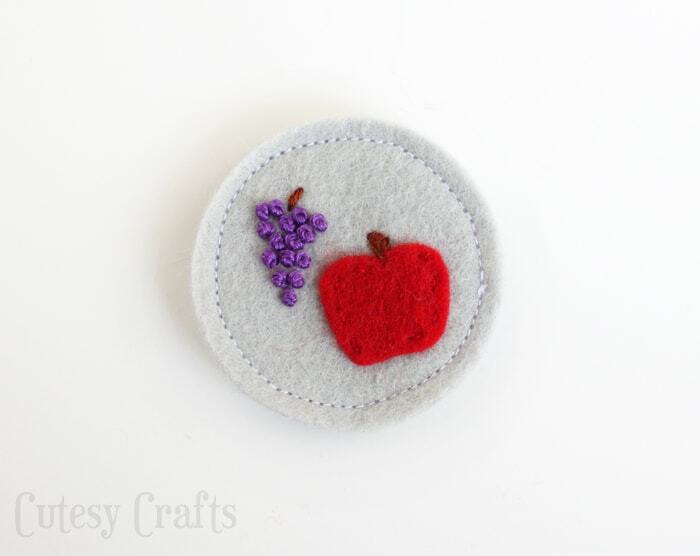 Sew a piece of velcro (soft side) onto each line, one inch away from the side of the circle. Spritz the fabric with water to get rid of the lines. If your lines are really stubborn, you can even throw it in the wash on a gentle cycle and lay flat to dry. 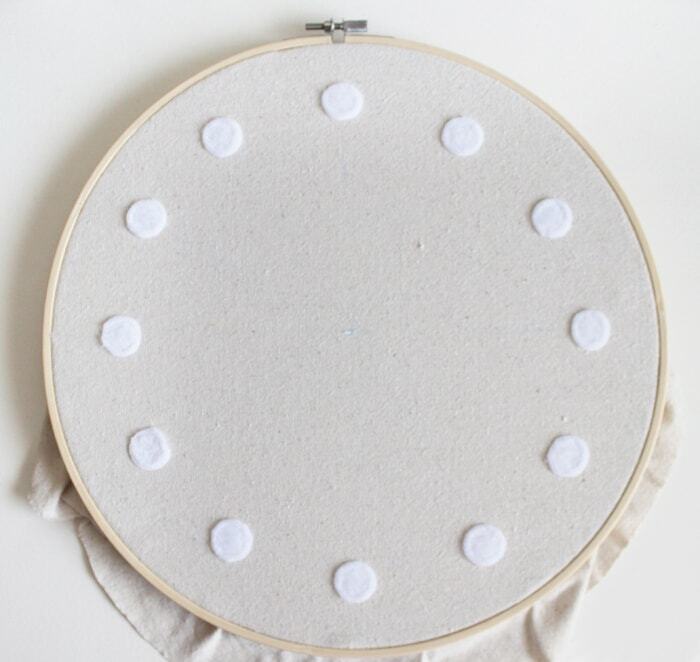 Put the fabric in your embroidery hoop and make sure to get it really tight and stretched across the frame. Cut a piece of cardboard to fit inside the hoop. 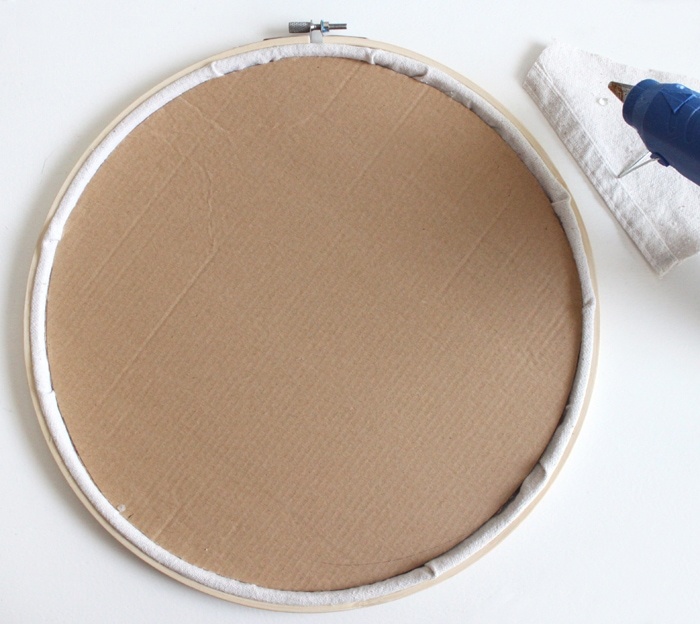 Turn the hoop over and tuck the edges of your fabric under the cardboard. Use some hot glue to secure everything. 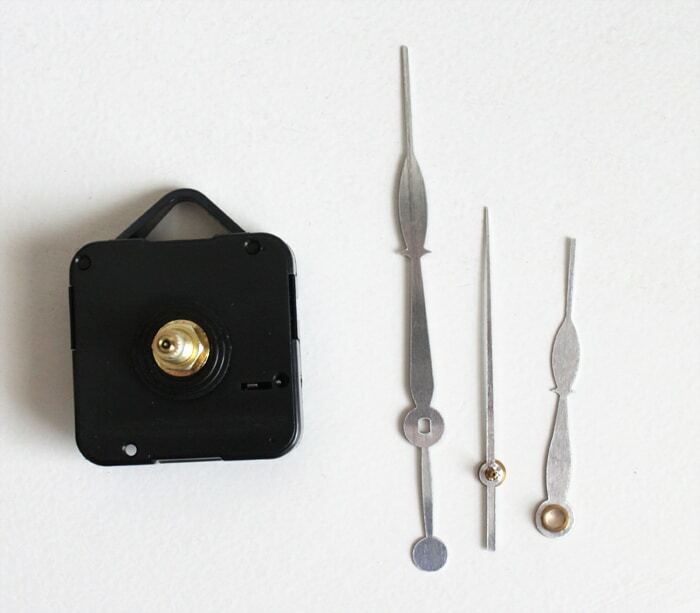 The clock kit that I bought looked like this. I broke the pin off the second hand and left the minute hand out altogether. That way there is only one hand for the kids to look at on the clock. Less confusing for them. 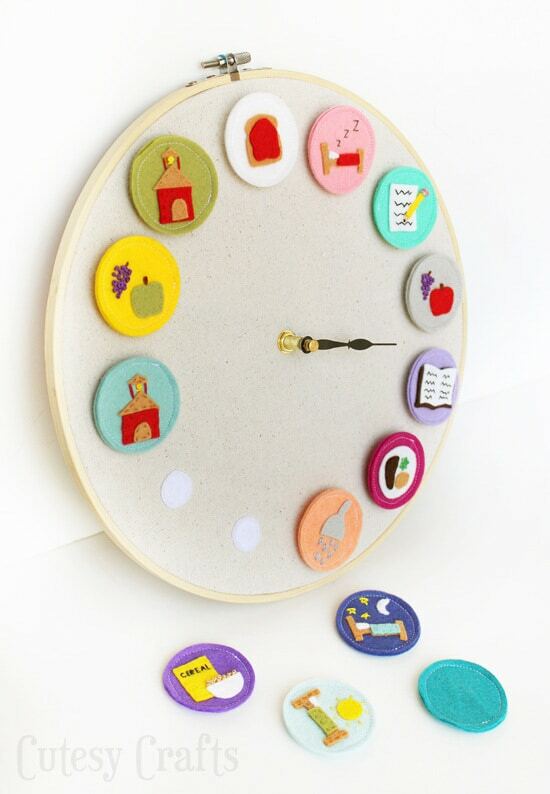 Poke a large hole through the cardboard and fabric, and follow the instructions on you clock kit to put it together. 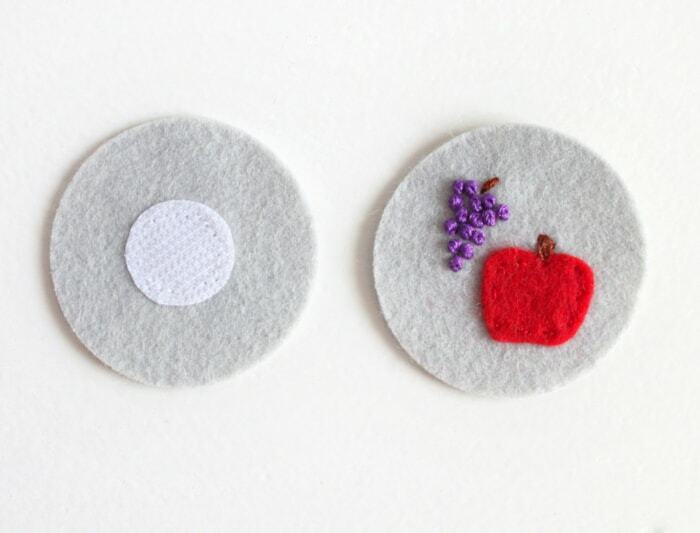 Cut two circles of felt for each of the clock icons that you want to make. 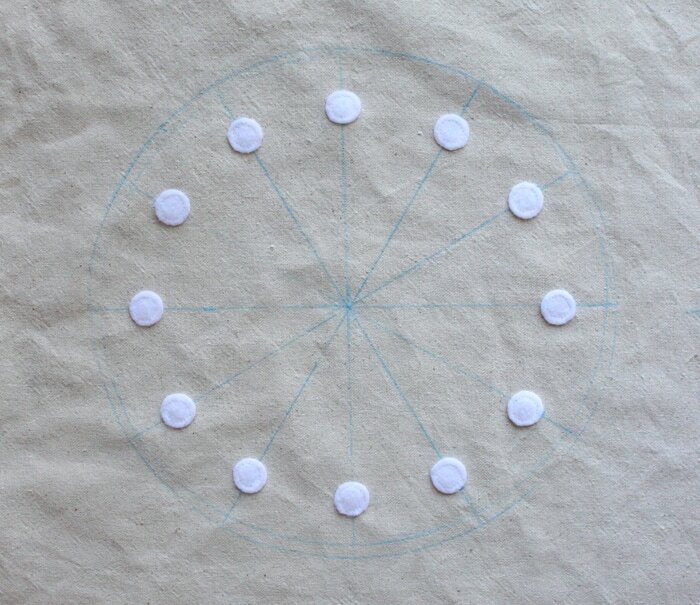 Embroider and applique your design onto one circle, and sew a circle of the scratchy side of velcro onto the other. If you need help with any of the stitches, I have video guides on my embroidery stitches guide page. Sew the two pieces together with your sewing machine or by hand. The little beds are for wake up, nap and bed times. 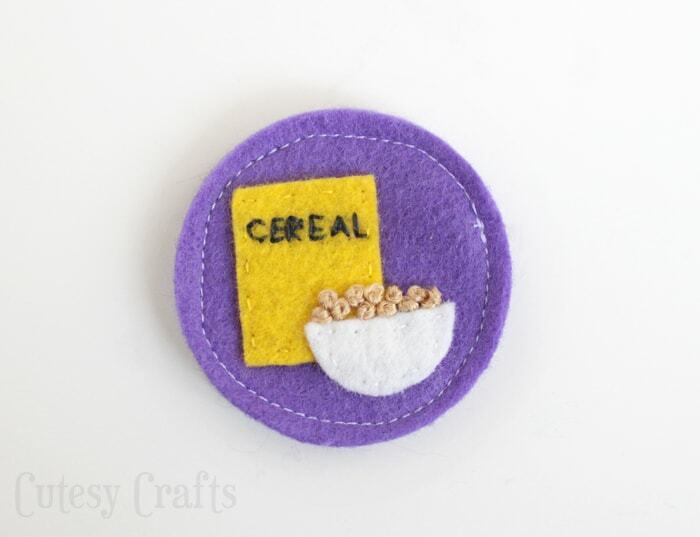 I think my favorite is the cereal bowl with the little french knots. I love french knots! 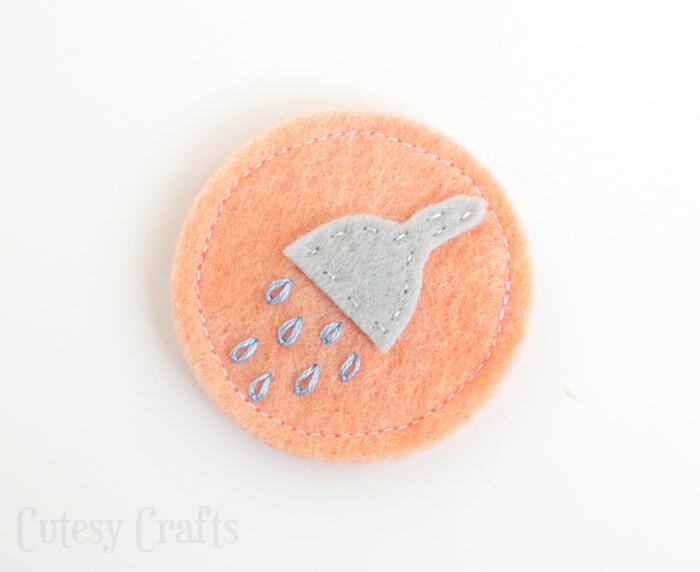 And the shower head with lazy daisy stitch water drops. Here are some more close-ups so you can see the embroidery. The bell on the school is a french knot and a straight stitch and the tip and eraser on the pencil are both stitched. The peas are also french knots. My kids LOVE it! 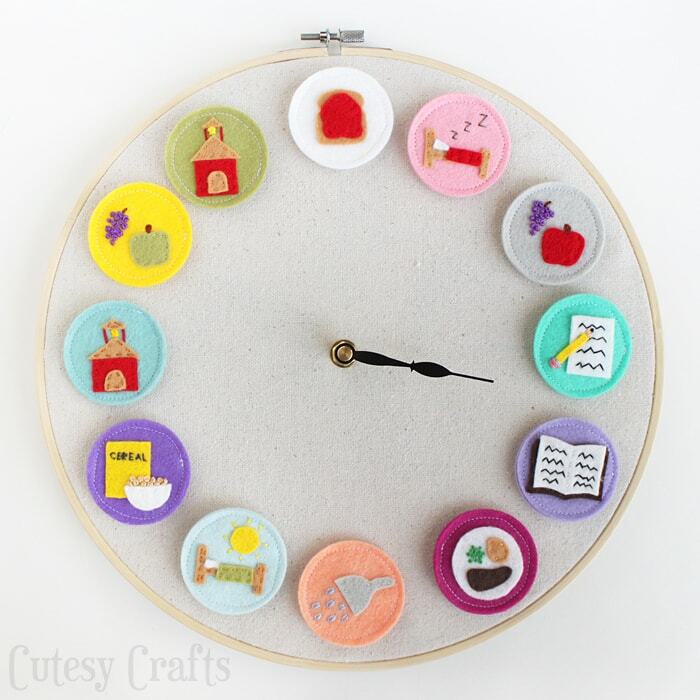 They are amazed that I could make a clock out of fabric that really works! They have already stopped asking me about meal times as often, and when they do, I just tell them to look at the clock. 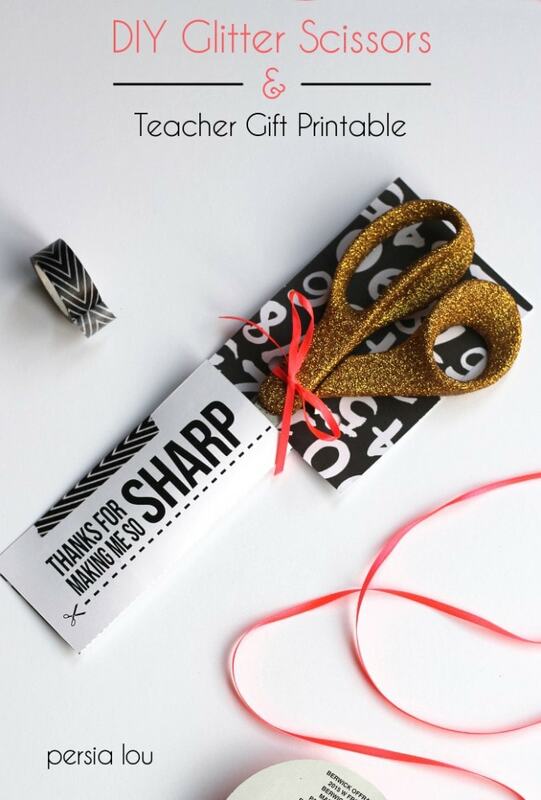 And here are a couple more great back-to-school ideas from my blogging buddies! Those little cheerios! You are killing me – they are just too, too cute. You are so talented! Love all the little embroidery, and love the idea too. So fun! This is darling!! What a cute idea! Pinned. Haha, YES! So glad you like it and will be making some! My kids are loving it! Although I have to remember to switch out the morning bed and the bowl of cereal in the afternoon, or my girls are asking for cereal before bed. Hahaha! 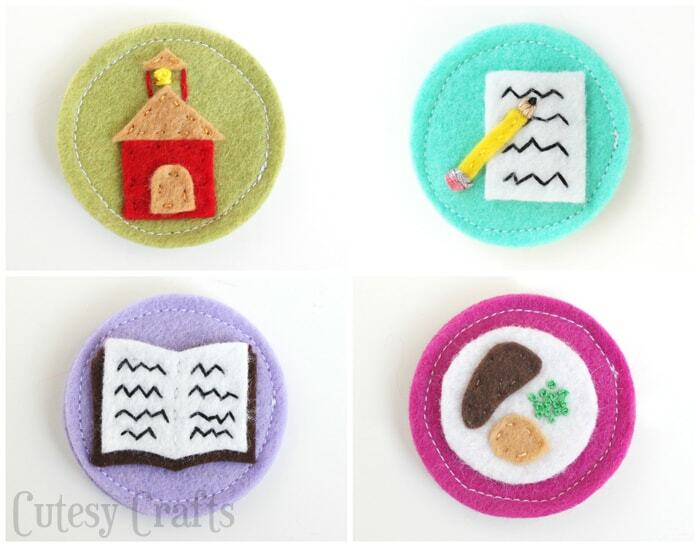 These are ridiculously cute and well done!! I love this more than words! I called my husband over to look and even he was impressed and thought it was awesome. WINNER! Of course I featured it on Do Tell Tuesday, I couldn’t resist!! Thanks for linking up! This made my day. Aw, thanks, Melanie! It must be a good one if husbands think it’s cool! 😉 Thanks for the feature! Oh my heck! I love making clocks and this one is the cutest. I am in love with all of the little details on your icons. My kids will love this! I love this! 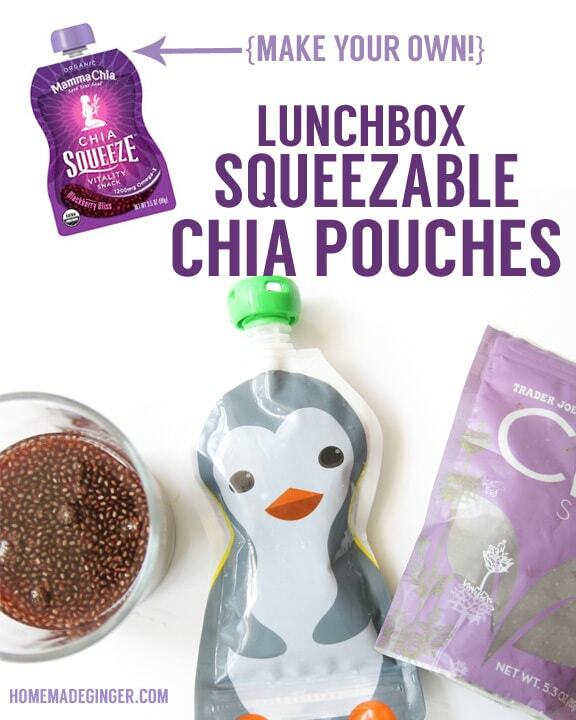 This would be great for my son at home or my preschool class! Do you sell these?!! Fabulous! 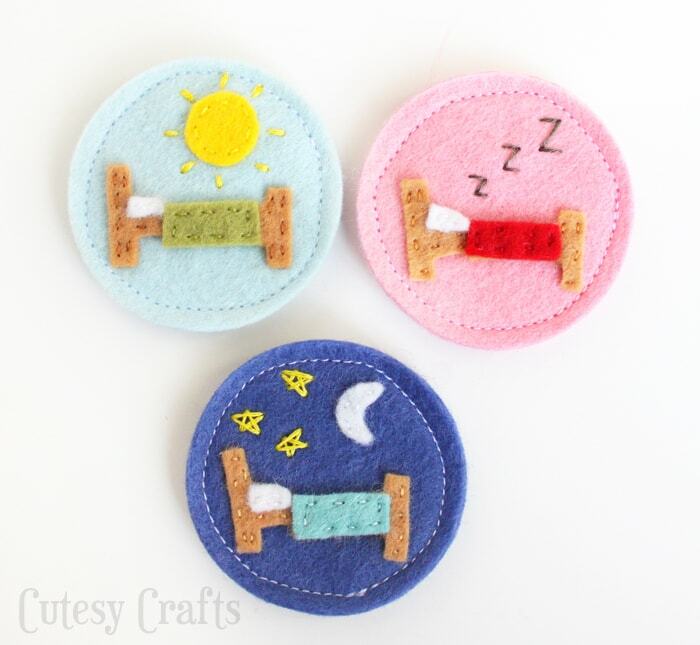 I was looking online to see if someone had made a clock to show meal,play nap time etc and look at this!! It’s just gorgeous..kudos! Thank you! The plan was to change them out each day since the pieces are velcro. To be honest, that doesn’t really happen though. Instead I choose which events are most important for my kids to see for their schedule and leave those up.